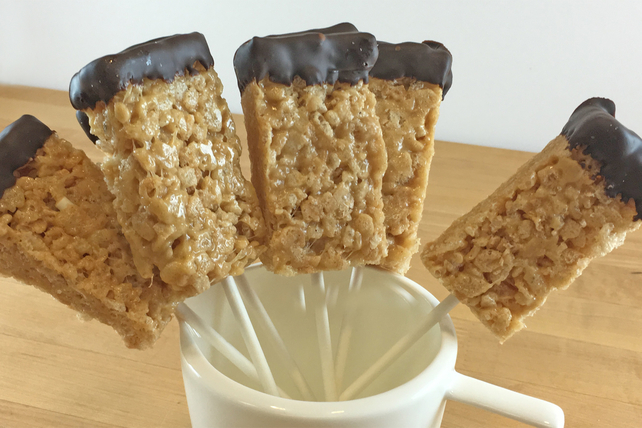 Our Crispy Peanut, Marshmallow and Chocolate Pops are so cute! And since there's no baking involved, these fun tasty treats are easy to whip up. Microwave butter in large microwaveable bowl on HIGH 45 sec. or until melted. Add marshmallows; toss to coat. Microwave 1-1/2 min. or until marshmallows are completely melted, stirring after 45 sec. Stir in peanut butter. Add cereal; mix well. Press onto bottom of 13x9-inch pan sprayed with cooking spray. Refrigerate 30 min. Cut cereal mixture into 24 bars. Insert wooden pop stick halfway into one short end of each bar. Cover baking sheet with parchment. Microwave chocolate in small microwaveable bowl 1 to 1-1/2 min. or until completely melted, stirring every 30 sec. Dip 1 end of each bar into chocolate; shake gently to allow excess chocolate to drip off. Place on prepared baking sheet. Refrigerate 30 min. or until chocolate is firm. Prepare using Kraft Crunchy Peanut Butter or Kraft Extra Smooth Peanut Butter. Melt butter in large saucepan on low heat. Add marshmallows; cook and stir until marshmallows are completely melted and mixture is well blended. Remove from heat. Stir in peanut butter. Add cereal; mix well. Press onto bottom of 13x9-inch pan sprayed with cooking spray. Refrigerate 30 min. Continue as directed.